I felt like i had to post this, you know?. 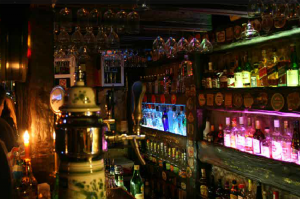 There are loooots of bars in Buenos Aires. But few of them actually have a great variety of beers. I spent most of my weekends, during the past ten years, finding the best places to go. And it turns out… there is nothing like staying at home. Yeah, i might sound like an old man. But if you go to a bar, you cannot drive for two good reasons. The police might take your car, or even worse, you won’t be able to find a parking spot. Okay, that might sound backwards… but anyways. This one used to be my point of reunion for years. It’s a nice place, located in Las Cañitas, Belgrano. They have a wide variety of beers. It’s pretty expensive, though. They produce their own beers. Again, this is a very expensive place. But i dare to say, it’s worth every single penny. If you go there, ask them a Honey Beer. You won’t regret it. They’re sort of Buller’s competition. They match them in quality, and in price. The huge advantage they have is their locations. You can find an Antares righ there, in Las Cañitas (2 blocks away from Van Koning), and yet another one 3 blocks away from La Viruta. No surprise, this is the place i like the most.